It’s crispy, beefy, spicy, and moreish. That is the description of the Somali samosa. We have yet to come across someone who didn’t fall in love with it at first bite. Somalis love their samosas and it is the cornerstone of the asariye (Somali afternoon tea). It is usually served with qamdi or bur, bajiyo, and shaah caddeys (spiced Somali tea with milk). Lately, the asariye also includes xalwo (halwa). Somali samosas are spicy-aromatic, not spicy-hot, even though a few prefer to add some extra chilli. In a few cases you might come across fish samosas or vegetarian samosas served in Somali cafes. 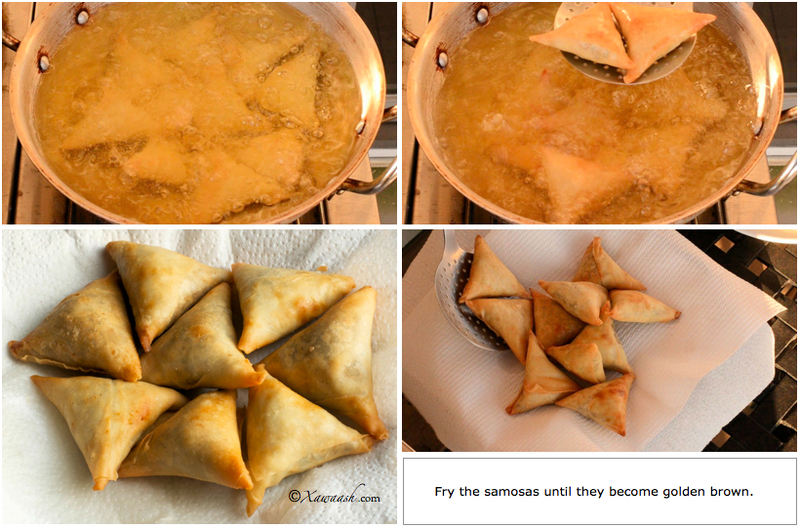 However, for Somalis, a sambuus (samosa) almost invariably means a beef samosa. A samosa is best eaten slightly hot when it is at its crispiest. If you are the impatient type that likes to eat food right after it is fried, there is an art to handling a piping hot samosa. Something that never fails to amaze us is the number of techniques people have devised for cooling a hot samosa. There are those that bite off two corners and blow on one side to let out the steam from the other end. Talk about impatience, talk about loving samosas! 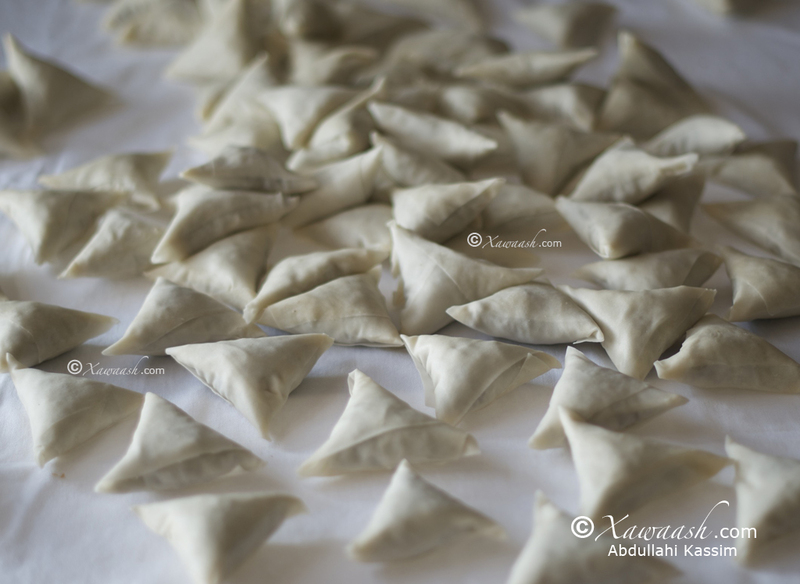 Somalis prepare the samosa pastry from scratch. For this recipe, we decided to use Spring Roll Pastry that is readily available in most, if not all, Asian supermarkets. It cuts down the time it takes to prepare the samosas and the pastry delivers the required crispiness. With the different varieties of samosa pastry available, from flaky to crispy, we didn’t see the need to prepare it from scratch. 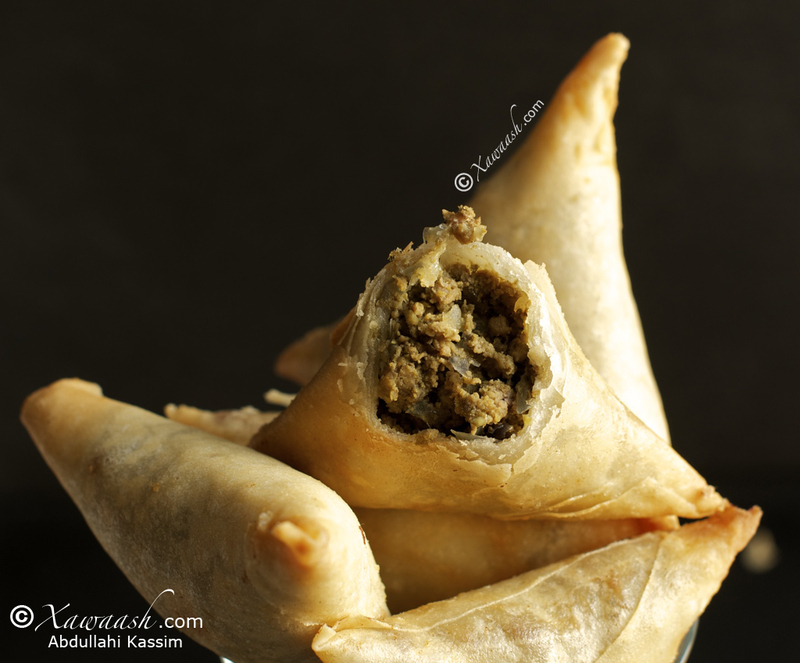 However, if you would like us to post the recipe for samosa pastry, let us know and we will oblige. No one likes oil dripping down their chin when they bite into a samosa. It is enough to make you part ways with this delightful appetizer. We had our butcher grind for us an Eye of Round for that extra lean ground beef that we wanted. The recipe also has just a little vegetable oil which we believe is tons better than the animal fat in regular ground beef. C’est croustillant, au boeuf, épicé et avec un petit goût de revenez-y. Voici la description du samosa Somali. Nous n’avons jamais rencontré quelqu’un qui n’était pas tombé amoureux à la première bouchée. Les Somalis aiment leurs samosas, la pierre angulaire de l’asariye (le thé de l’après-midi Somali). Ils sont servis d’habitude avec qamdi, ou bur, bajiyo, et shaash caddeys (thé au lait épicé Somali). Depuis peu, l’asariye inclut aussi xalwo (halwa). Les samosas Somalis sont épicés-aromatiques, pas épicés-piquants, même si un petit nombre préfère ajouter du chili en plus. Quelques rares fois on trouve des samosas de poisson ou végétariens servis dans les cafés Somalis. Cependant, pour les Somalis, un saambus (samosa) est presque invariablement synonyme de samosa au boeuf. Un samosa est le meilleur quand il est mangé encore un peu chaud à son plus croustillant. Si vous êtes du type impatient qui aime manger la nourriture quand elle est juste frite, c’est tout un art de tenir un samosa brûlant. Nous sommes toujours étonnés de voir combien il existe de techniques pour refroidir un samosa bouillant. Il y a ceux qui mordent dans deux coins et soufflent d’un côté pour faire sortir la vapeur de l’autre. Quelle impatience, et quel appétit pour les samosas! Les Somalis préparent la pâte à samosas eux-mêmes. Pour cette recette, nous avons choisi d’utiliser des feuilles pour Rouleaux de Printemps qui se trouve dans la plupart des supermarchés Asiatiques. Cela réduit le temps de préparation des samosas et la pâte apporte le croustillant nécessaire. Avec toutes les différentes variétés de pâte à samosas disponibles, de feuilletée à craquante, nous n’avons pas eu besoin d’en faire une nous-mêmes. Cependant, si vous souhaitez que nous publiions la recette de la pâte à samosa, dites le nous et nous le ferons avec plaisir. Personne n’aime quand de l’huile coule sur le menton quand on mord un samosa. Ça peut être suffisant pour être dégoûté de ce délicieux amuse-bouche. Nous avons demandé à notre boucher de nous hacher du rond de gîte pour avoir un morceau de boeuf très maigre. La recette utilise un tout petit peu d’huile végétale qui, nous pensons, est bien meilleur que la graisse animale dans du boeuf haché. Finely chop the garlic, cilantro, and seeded jalapeno. If you like extra heat, do not remove the seeds from the jalapeno. Heat the oil in a pot set over medium high heat. 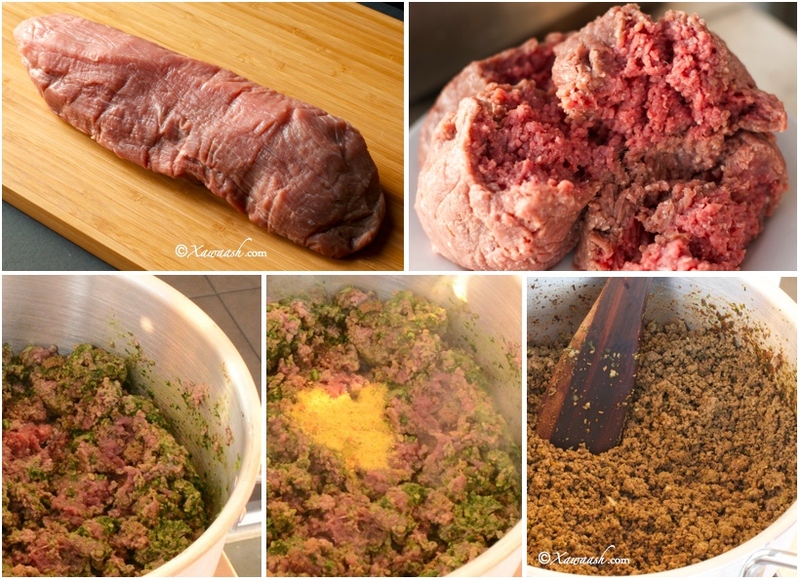 Add the xawaash and then right after, add the ground beef. Make sure that the spices do not burn. Add the chopped garlic, cilantro, and jalapeno. Add the vegetable seasoning. Stir and break down any lumps. The beef stuffing will be ready when all the moisture has been absorbed. Set aside to cool. Hacher finement l’ail, le coriandre, et le jalapeno épépiné. Si vous aimez plus piquant, ne retirez pas les graines du jalapeno. Chauffer l’huile dans une casserole chauffée à feu moyen. Ajouter le xawaash et juste après, ajouter le boeuf haché. Ne pas faire brûler les épices. Ajouter l’ail, le coriandre et le jalapeno hachés. Ajouter l’assaisonnement légumes. Remuer et séparer les grumeaux. La farce au boeuf est prête quand tout le jus est absorbé. Mettre de côté et laisser refroidir. 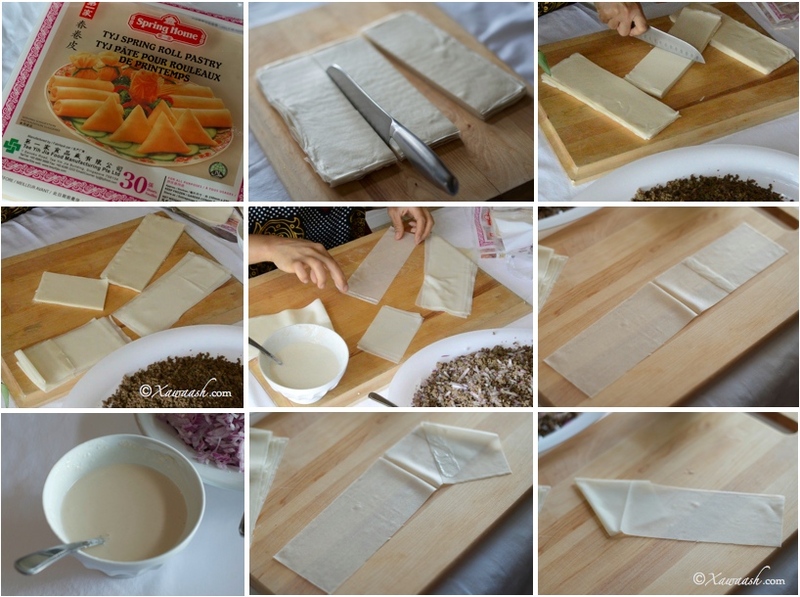 Prepare the thawed samosa pastry by cutting it into three equal strips. Then cut one of the strips in half. This will be attached to the other pieces to make an elongated pastry. The reason for this is to have many layers when you fold the samosa. This is what will make the samosas crispy. With almost the quantity of filling as a samosa, egg rolls are rolled with a whole sheet of pastry. They get their crispiness from those multiple layers. 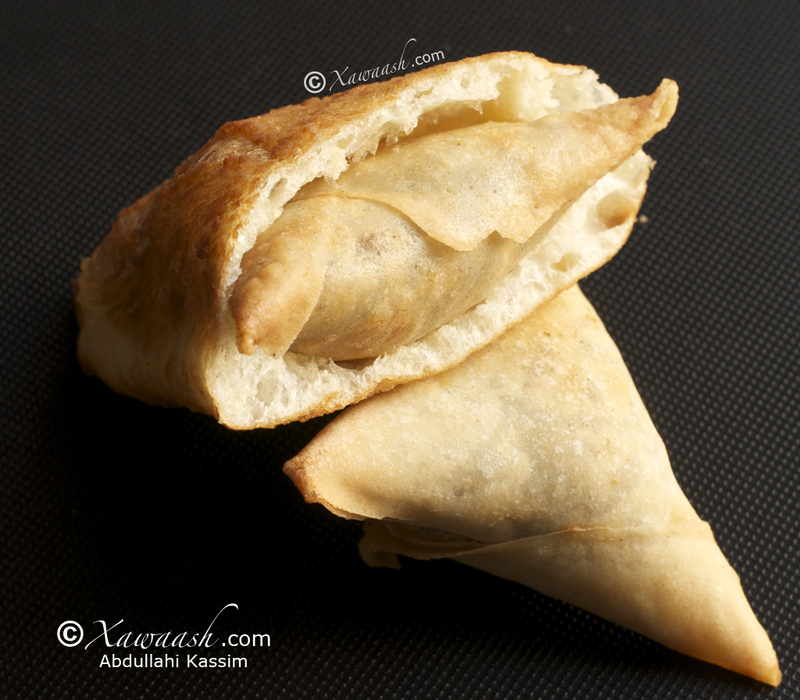 Another option is to use two layers of pastry for each samosa, but that will yield only 45 samosas instead of 60. Whichever method you use, the samosas will be crispy. Préparer les feuilles à samosas décongelées en les coupant en trois bandes égales. Puis en couper une des bandes en deux. Elle sera attachée aux autres morceaux pour faire une pâte allongée. La raison à cela est pour faire plusieurs épaisseurs lors du pliage du samosa. Cela rendra le samosa croustillant. Avec la même quantité de farce que pour un samosa, les pâtés impériaux sont roulés dans une feuille entière de pâte. Leur croustillant vient des multiples couches. Il existe aussi l’option d’utiliser deux couches de pâte par samosa, mais il n’y aura que 45 samosas au lieu de 60. Quelle que soit la méthode utilisée, les samosas seront croustillants. Dice the onions then add to the completely cooled ground beef. 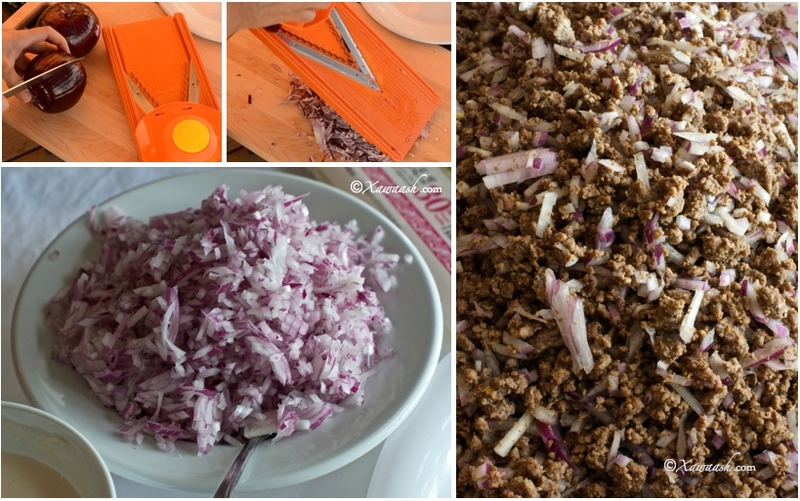 If the beef is still warm, it will extract moisture from the onions and this will in turn make the samosa pastry soggy. The drier the samosa filling, the crispier the samosas will be. Couper les oignons en cubes puis les ajouter au boeuf haché complètement refroidi. Si le boeuf est toujours tiède, il fera suer les oignons et le jus détrempera la pâte. Folding the samosa is pretty straightforward once you get the hang of it. The photos below show the steps, but we strongly suggest that you watch the video. The crucial thing to remember is that the samosa shouldn’t have any openings for the oil to enter the filling. Getting the folded samosa to look pretty will take a little practice. Le pliage des samosas est assez simple une fois que vous avez le coup de main. Les photos ci-dessous montrent les étapes, mais nous vous recommandons fortement de regarder la vidéo. Le point crucial à retenir est que le samosa ne doit pas avoir d’ouverture où l’huile pourrait pénétrer dans la farce. Pouvoir plier un joli samosa nécessitera un peu de pratique. Using a frying pan, heat vegetable oil on medium high heat. If using a deep fryer, set the temperature to 365°. Fry the samosas until golden brown. Drain on a plate covered with paper towels. Dans une poêle à frire, chauffer l’huile végétale à feu moyen. Si vous utilisez une friteuse, la faire chauffer à 365°F/185°C. Frire les samosas jusqu’à ce qu’ils soient dorés. Égoutter sur une assiette recouverte de papier essuie-tout. Serve the samosas with qamdi or bur and a hot cup of Somali tea. Enjoy! Servir les samosas avec qamdi ou bur et une tasse de thé Somali chaud. Bon appétit! You can see in the photo above that some of the samosas have two layers of pastry. Vous pouvez voir dans la photo ci-dessus que certains samosas ont deux feuilles de pâte. I enjoy snacks more than I enjoy actual meals, especially in the afternoon. They help fuel my body & boost my energy. & the one that I probably enjoy more than any other is samosa whether beef samosas, chicken, fish, or vegetable samosas. I am really addicted to samosas. I could eat loads of them each and every day! I don`t like the baked version though. I like mine fried, My sister made me some this morning, I couldn’t stop licking the plate lol! Thanks for sharing all these wonderful recipes with us Abdullahi! I love your step by step instructions with pictures and videos. May Allah Bless you & your wife for all your hard work. ASC: WAA IDIN SALAAMAY SHAQA WACAN WAXAA ISOO XASUUSISEEN SOMALIA. SHAQA FIICAN AAD QABATEEN. KULIGIIN. I LIKE YOUR WEBSITE XAWAASH. MEESHA KA SIIWADA DADAALKA. MACASALAAMAH . Wacalaykum Assalaam Walaal Adam. Aad ayaad ugu mahadsantahay faallada wanaagsan aad ka bixisay websiteka Xawaash. Waxaan kaloo ku faraxnay in walaalaheenna joogga Japan ay booqdaan websiteka Xawaash. Mahadsanid. Thank you for your comment and we hope you keep visiting. Keep up the good and look forward in taking note to impress my family..! !shhhhhh don’t tell no 1. Thank you Osman. We hope that the recipes help you to translate your passion into action! As Salamu Alaikum, Jazakallahu Khairn, Im learning to cook from you page, thank you for sharing your skills this makes my husband very happy when I can cook food. Please can you tell me how to make the Somali cake that is like pound cake? it has no icing, but very rich in buttery tasting. Wacalaykum Assalaam. We will make that Somali cake, God willing. Thanks for the comment. I prefer to make my samosa pastry form scratch it makes all the difference in the world. Maybe you could put up a recipe for “Folio” on your website. Keep up the good work I enjoy reading your recepies I am curently making your “Barris Isku Karis” for my family. You are absolutely right. 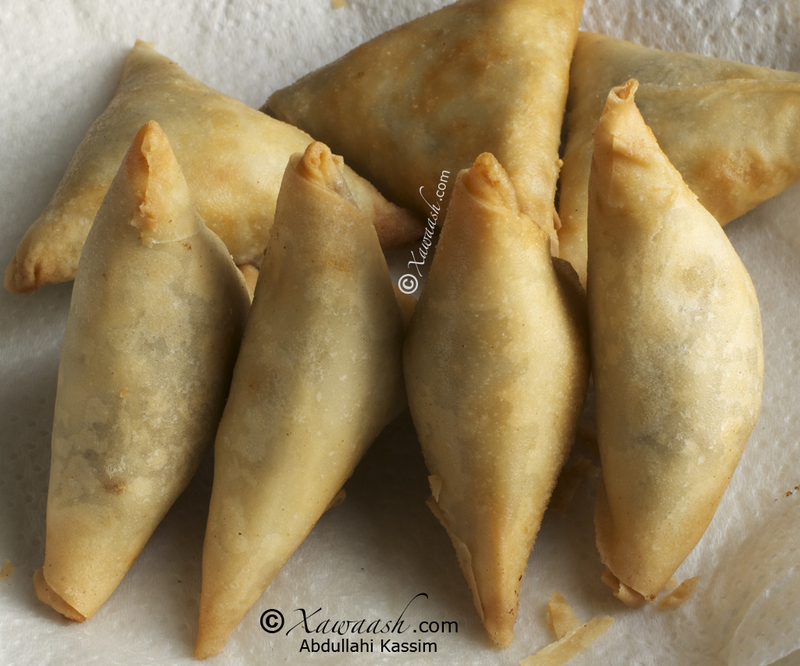 Nothing can beat homemade samosa pastry. The reason we didn’t include it in the recipe for samosas is that a lot of people think that making samosas is very time-consuming. Add to that the burden of making the pastry from scratch and you’ll scare away a lot of people from trying to make samosas. We wrote that we will post a recipe for the pastry if it is requested. 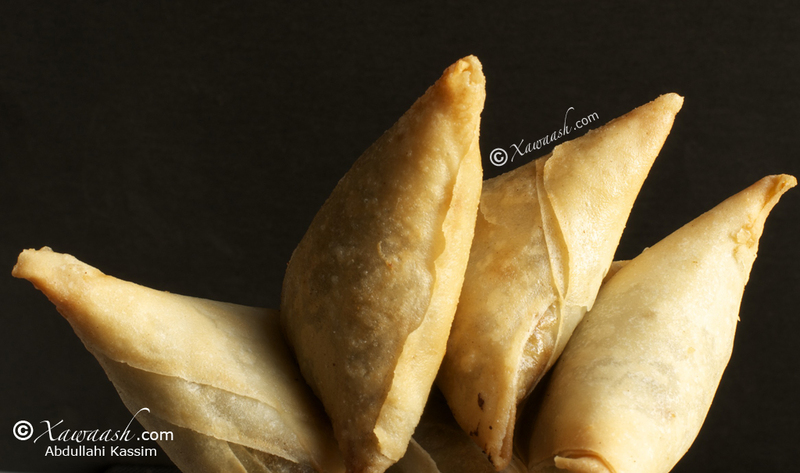 It’s clear that you know how to make it but we will include the recipe for samosa pastry in our ever-growing list of recipes that we want to cover. Thank you for the comment. Lived in Somalia when I was young while my parents were working there. I have fond memories of it to include the food. Somalia will always have a place in my heart. I was very excited to come across your blog when searching for how to make anjero and my mouth started to water looking at all your recipes. I remember samosas being one of my favorite snacks and eating them often and was glad to see your recipe. I too would love a recipe for samosa pastry to make from scratch. I have family members that cannot have a lot of processed foods due to allergies and so I make most of my stuff from scratch. Thanks you so much for this blog, I see lots of Somali meals in my family’s near future! Thank you very much for your comment. We will post a recipe for samosa pastry. laba arimod kaliya ayan ka hadli ta hore waa dadkan commentga qoralka ku soo qoraya waxan ka codsan laha in ay afkooda hooyo ku qoraan oo ay naga dhafan afkan qalad ee ay dadka ugu qorayan mesha idinko mahsan. Aad ayaad ugu mahadsan tahay sida aad dhammaanteenna noogu guubaabisay inaan afka hooyo tixgelinno, qadderinno, kuna dhaqanno. Illowse, waxaa jira dad faran badan oo qurbaha ku-dhashay kuna koreen oo waalidkooda luqadda barin. Dhalinyaradaas dambi kuma lahan inaysan af-Soomaaliga wax ku-qori aqoon. 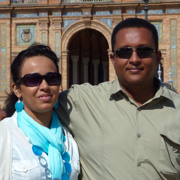 Eedda waxaa leh waalidka aan ku-dadaalin inay ubadkooda ku ababiyaan dhaqankeenna iyo luqaddeenna. Waxaa loo baahan yahay in dhallinyaradaas si deggan oo macaan wax la u-tuso, loona baro, oo aan hadalka loo kululayn. Waad ku-mahadsan tahay faallada wacan ee aad ka-bixisay webkan. I am a really big fan of this website! Thank you so much for putting the recipe with a video and instruction with photos. Sambuusa is a timeless snack. I never met somebody who didn’t like it. When you make the pastry by yourself, do you use the same folding technique? Thank you very much, Fatima. Yes, Sambuusa is a very popular snack! When we make the pastry from scratch we also use that same method which is what is used Brava, Somalia. However, when we post a recipe for sambuusa dough, we will use the much easier method that many people in Somalia are familiar with. Thanks again. In Somalia I always wondered how sambuusa from Brava looked so perfect! Because of the folding method I remember that people selling sambuusa, cake and cookies kept everything secret. Good old memories! I just made sambuusa with your folding method and I have now perfect triangles! I am very happy to read that you will post a recipe for the dough. Thank you so much for this! Thank you very much for the feedback. Thanks for taking the time sharing your experience. I’m a big fan of your website and your videos are very helpful. 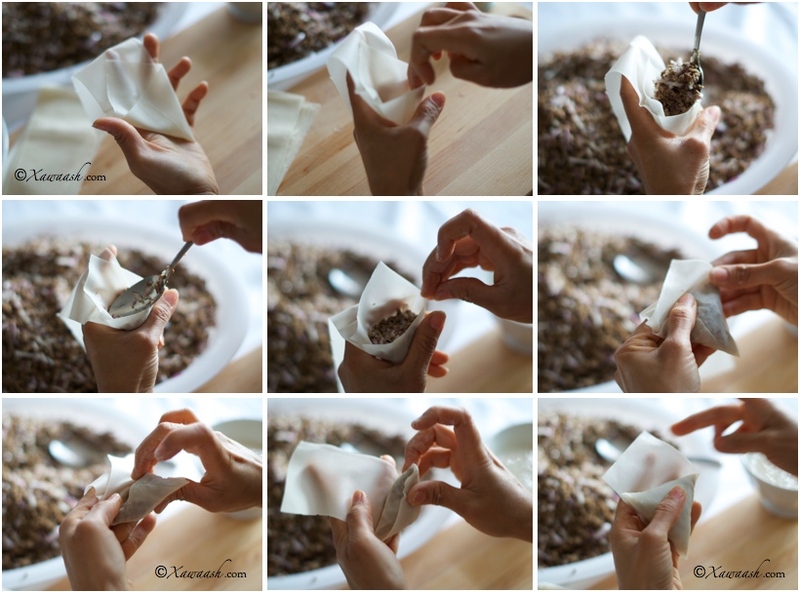 I love making Samosas and was wondering if you could possibly show me how to make Samosas in a roll format? 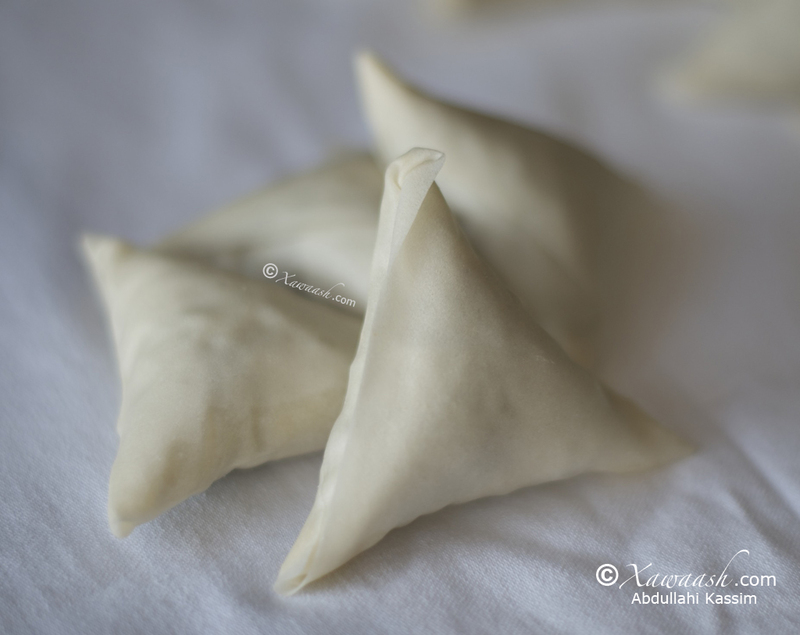 We are planning to post a recipe for homemade samosa pastry and we will show an easy technique for folding it. It makes us really happy that more and more newlyweds are finding this website helpful. Thank you for the nice words. We will post cambuulo and oodkac, God willing. Mashallah Awesome job with the blog I love all your cooking. And this has helped me a lot. May Allah reward you. We are happy we could help. Thank you very much for your comment. Mashallah I’m in love with ur website and may allah reward you for it. I have one request to ask if u can tell me how to make the Somali BasBas. Thank you in advance. Thank you very much for your compliment. We are happy you like the website. 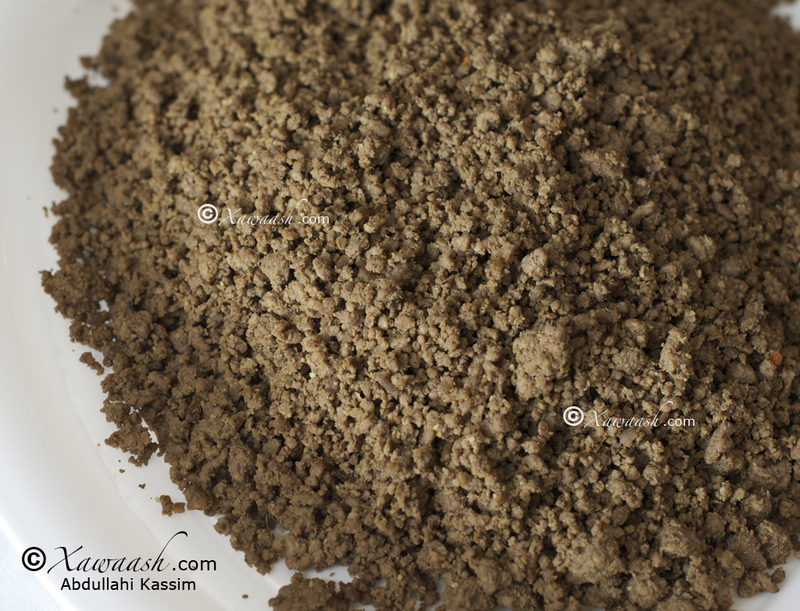 We will post Somali basbaas but in the meantime you can use the recipe for basbaas from the Bajiya post. aad iyo aad ayaad umahadsan tihiin qof kasta oo gacan ka geeystay faahfahinta karinta cuntooyinka somaliyeed khaas ahan sanbuska. waxaan ahay arday wax ka barta wadanka mareekanka waxaana rabaa in aa usheego ardayda sida saan buuska loo sameyo eey una fahmaan marka websitkan run ahaantii waxaan kafaideystay sawirada iyo walib recipega oo saanbuska sida loo sameyo waxaan jeclaan laha inaad kusoo dartaan recipega sanbusa pastry. thank u very much, i realy apreciated!!!! Adigaa mahadda mudan walaal. Burka sambuuska ayaa ka-horeeyey sambuuska, linkiga waakan http://xawaash.com/?p=3412. Mahadsanid. Hi how long do the samosas keep after they are cooked? These types are better served immediately after frying. As a general rule do not keep cooked food out for more than 2 hours, after that the samosas need to be refrigerated. You can freeze them for up to 3 months. Fry them while frozen. To warm up cooked samosas, use a toaster oven; do not microwave. Thank you for the questions. You should have pinterest added to your website. Insha’Allah, we will add it. Thank you very much. Assalamualaikum walaalo these recipes are all amazing masha’Allah! 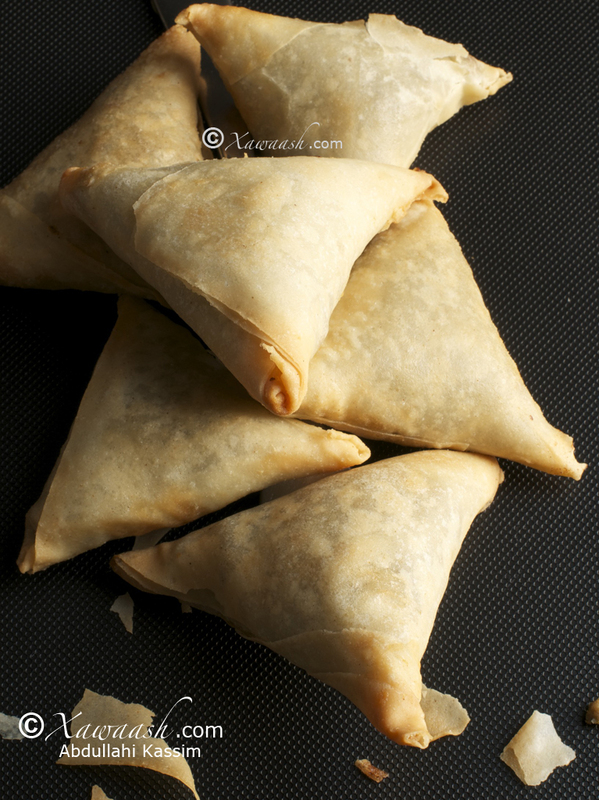 I was curious, if i make these sambusa’s then want to have left overs how would I freeze them and is that possible? Yes, you can freeze them after folding. We line them up on a tray, freeze them in a single layer and then put them in ziplock bags. Okay, so I should lay them out on a tray row by row and freeze them and once they are frozen put them into ziplock bags? When I am ready to use them how long do i leave them on the counter to defrost before frying without it being soggy? Thank you soo much walaalo for your help! Yes, or place them on a tray in a single layer. You don’t need to fully defrost samosas before frying. Bring them out while the oil heats up and then fry them. Thank you. We wish you all the best.